This removes particles from the water down to 1 micron. This filter contains activated carbon mixed with KDF. The KDF has anti-bacterial properties and prevents the growth of bacteria within the filter, thus extending its life to twice that of standard activated carbon. This is a physical barrier that will not allow bacteria to pass through. The membrane is made from an organic substance and thus contains a preservative to keep it in optimal condition. This preservative needs to be flushed from the system before drinking water is produced. Uses UV Rays at a specific Frequency to damage to the DNA of Bacteria and Micro-Organisms, reventing them from preforming biological functions such as breedcing and feeding. The UV Light provides you with an additional barrier against bacteria content. This is done by running water through the system until the preservative cannot be detected in a sample glass of water. The preservative leaves a “film” on the water and also has a bitter taste. If you are seeing this in your water after a new installation, flush and test until no hints of the preservative can be detected. Please note if there is a white colour to the water that settles out towards the top of the glass, this is most likely caused by tiny air bubbles in the water. This is caused by the Ultra Filtration membrane, and is completely normal. This should subside over time as excess air in the system is removed. The air bubbles in the water will not effect the quality of your drinking water. Start by unscrewing the filter housing from the filtration unit. This is done by rotating the filter housing in a clockwise direction (see diagram below). The filter housing will separate from the filtration unit, and you are now free to remove the filter cartridge from the filter housing. To replace your filter: insert the new filter into the filter housing. Be sure to remove any protective plastic wrapping from the filter cartridge before placing them into the filter housing. Check that the black rubber O-rings are in place and fit well on the filter housing. If they seem perished or loose you may want to purchase new O-rings to ensure a good seal. As an option you can add a little bit of Vaseline on the O-rings to make them seal better, this will make it easier to open next time. Take note of any rubber seals on the filter cartridges, usually the KDF & UF. These will need to face upwards to connect and seal at the top of the filter housing. It is important that this is done correctly as the system will not work optimally if the filters are installed incorrectly. Now that your filter is in the housing, bring the housing to the filtration unit and begin to screw the two together. This is done by rotating the filter housing in a anti-clockwise direction. We recommend you tighten by hand as this is usually sufficient to maintain a good seal. If however, leaks are detected, the housing spanner can be used to tighten the filter housings until a good seal is achieved. (Check O-rings are correctly in position before tightening with the spanner) Please take care not to over-tighten the filter housings. This could strip the housing thread and cause your system to fail. It will also make it more difficult to replace filters in the future if they are over-tightened. The UF filter cartridge may require more tightening as the rubber seal on these cartridges are made from a harder rubber. Filter life span is determined by the quality of the source water that runs through them. So if your source water is of a very bad quality, your filters will be doing more “work” to clean the water that is flowing through them. Thus depleting sooner than filters running under good water conditions. So in short each end-users filter requirements will be different as their source waters are different. We advise you check your filters on a monthly basis after initial install to get a feel for the quality of the water in your area. You will see for example, that the stage 1 filter (1um Sediment) is turning brown from the outside towards the centre over a period of 12 months. If this is the case, your water quality is exceptionally good as these filters generally only have a life span of 4 - 12 months filtering average South African water. 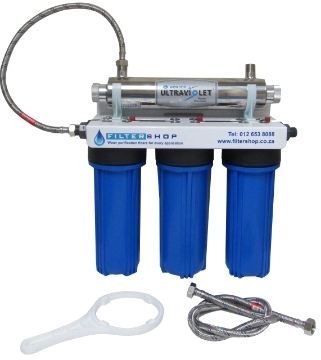 If your water quality is very poor you may be replacing the 1um sediment filter every 2 months. So visual inspection of your filters is the best way to determine when to change your filters. For the KDF and UF filters the “symptoms” are a little different. These filters are depleted once bacteria has colonised them completely. So in testing you will want to see if any traces of bacteria can be detected. This is done by physically inspecting the filter cartridges. You want to check for a “slime” on the filters. This is a slippery substance and will feel similar to a mucus of sorts. If this is present on your filter cartridge then bacteria has colonised the filter and a replacement cartridge is required.When changing the KDF Cartridge it is the ideal time to replace the UF and possibling the 1 Micron Sediment as well. The UF membrane can also become clogged, if you are noticing a much lower flow rate on your product water side of the system, this could be the cause. In which case the UF membrane cartridge may need to be replaced before the KDF. The Ultra Violet Light's Bulb Needs to be Replace once every 12 months (8000 to 9000 Hours) irrespective of the quality of the source water.